On April 19, 2005, Cardinal Joseph Ratzinger was elected to succeed John Paul II as pope. Pope Benedict, as he is now known, was, in the decades before his ordination, the theologian primarily responsible for framing the Church's position on reproduction and the dignity of human life. In his address on behalf of the Congregation for the Doctrine of the Faith, titled Instruction on Respect for Human Life in its Origin and on the Dignity of Procreation (Ratzinger 1987), Ratzinger reinforced the Vatican's position against abortion and birth control and laid out objections to new reproductive technologies like IVF. This document provided Catholic theologians with the framework to oppose the oncoming tide of embryonic stem-cell research and cloning made possible by assisted reproductive technologies. The day after Pope Benedict's election, Lucio Gutiérrez, the beleaguered president of Ecuador (and one of only two elected presidents in a decade), was ousted after months of protests. Widespread dissatisfaction with the incompetence of his administration, along with outrage over his capitulation to IMF-mandated austerity measures, had plagued his presidency since his election two years before. During his administration, Ecuador's congress ratified a new civil code that prohibited "the manipulation of human life after conception," which in theory could have restricted some practices within Ecuador's expanding IVF industry. The civil code, along with the 1998 constitution, which declared that "life begins at conception," were shaped within the emergence of evangelical Christianity as a powerful force in Ecuador and throughout Latin America. The near-simultaneous election of Pope Benedict and the toppling of Gutiérrez can inform our understanding of individual reproductive histories like Sandra's (see "Corporeal Punishment"). Both the procedures Sandra underwent, abortion and IVF, are of intense interest to church and state actors in sustaining the demographics of the faithful and of the nation-state. In Ecuador, the officially distinct but intertwined institutions of church and state impose restrictions that claim to protect unborn human life. The law against abortion is flouted by women of all classes (and by men, as partners and practitioners) but it is significantly more difficult for women without recursos (resources) to access safe clinical abortion. Sandra's misfortune was to be young, a recent migrant to the city, and lacking in familial assistance or monetary resources. She probably didn't feel able to "manage" her sexual encounters. Sandra didn't have the resources to seek out private clinical gynecological care for an abortion. She didn't think of herself as an individual with rights. She was a client with a patron-God-who didn't agree to her bargain. And when she entered the IVF clinic, she wasn't a consumer with rights either. Surgical abortion can be an extremely safe procedure with few side effects. In Ecuador, despite the law, women with money can undergo safe abortions in clinical settings. The women I met who had had clinical abortions or who had the money to leave the country suffered no complications. But the devastating effects of unsafe abortions on poorer women can have repercussions for decades. Sandra's abortion history, ectopic pregnancy, and poor hospital care made her infertile. Years later she sought out IVF in an expensive private clinic that theoretically should have been governed by the same church and state politics that outlaw abortion. But although Catholic doctrines and state policies scarred Sandra internally, they did not follow her into the private IVF clinic. As Cardinal Ratzinger, Pope Benedict was a famous hard-liner on the question of the protection of nascent human life. Vatican condemnation of IVF, as dictated by Ratzinger, is based on two main arguments. First, the research, development, and practice of IVF involves the destruction of embryos. The Church regards this practice as "destruction of human life," equivalent to abortion. Second, by engaging in assisted reproduction, humans are interfering with a process that should remain under God's dominion (Ratzinger 1987). Globally, much of the controversy surrounding assisted-reproduction technologies has come from religious institutions; but within Islam, Judaism, Confucianism, Hinduism, and most forms of Christianity, adjustments have been made to facilitate the fertility procedures of their adherents (Bharadwaj 2002; Handwerker 1995; Inhorn 2003; Kahn 2000). Catholicism remains the only major world faith that unequivocally condemns the use of IVF. Although the Vatican has influenced many of the debates over IVF in different parts of the world, this has not meant that all or even most Catholics heed its denunciation of this technology. In Ecuador, for so-called traditional and religiously conservative Catholics, an ongoing relationship with God has taken precedence over Church doctrine. In Ecuador, despite the 2003 legal code that bans the manipulation of life after conception, the law has had no impact on private reproductive medicine. It remains to be seen whether or how the views of the current president, Rafael Correa, an anti-abortion leftist who is implementing health-sector reform, will affect Ecuador's IVF industry. So far, IVF practitioners have ignored the strictures that might limit their practice. They see state regulations as largely irrelevant to their private medical practices and don't see the Church as speaking for God in its condemnation of IVF. Church and state institutions in Ecuador rarely interfere with the business of the elite men who tend to be the directors of private IVF clinics. These clinics appear to exist outside or above state and church oversight or regulation. Assisted reproduction, with its test tubes, injections, and gamete donors, raises concerns about the nature of life and kinship. Yet these concerns do not take the same shape around the world. In this innovative ethnography of in vitro fertilization in Ecuador, Elizabeth F.S. Roberts explores how reproduction by way of biotechnological assistance is not only accepted but embraced despite widespread poverty and condemnation from the Catholic Church. Roberts’ intimate portrait of IVF practitioners and their patients reveals how technological intervention is folded into an Andean understanding of reproduction as always assisted, whether through kin or God. She argues that the Ecuadorian incarnation of reproductive technology is less about a national desire for modernity than it is a product of colonial racial history, Catholic practice, and kinship configurations. 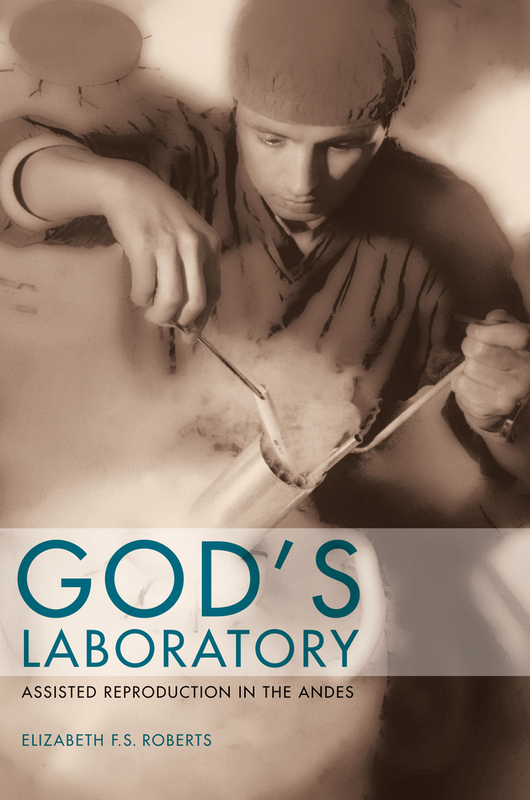 God’s Laboratory offers a grounded introduction to critical debates in medical anthropology and science studies, as well as a nuanced ethnography of the interplay between science, religion, race and history in the formation of Andean families. Elizabeth Roberts is Assistant Professor of Anthropology at University of Michigan.